Buckhaven and Methil – The Fife Post………..for genealogy and historical information. Buckhaven and Methil were formed in 1891 when the three towns of Buckhaven, Innerleven and Methil united to form a Police Burgh. Methil is said to have been created a Burgh of Barony in favour of David, 2nd earl of Wemyss, by Archbishop James Sharp of St Andrews in 1622. 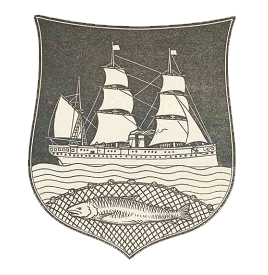 The burgh has not been recorded arms; the device on its seal shows a steamship with sails on the sea and a fish in a net below. the book The arms of the baronial and policeburghs of Scotland by John Marquess of Bute, J.H. Stevenson and H.W. Lonsdale. 1903. It lists which was a possible proposed arms for the burgh. (shown on the left) with the following words. On the waves of the sea, a screw steamship under steam and sail to sinister; within a net, in base arched, a fish naiant. The town clerk is good enough to inform us that “the design was intended to include, as it were, the industries of the burgh viz., fishing, mining, and shipping” and, in allusion to the mining industry, which seems otherwise unrepresented in the coat, we would suggest the field sable. The rest would be all naturally proper.